Just recently we were able to check out one of the most affordable and notable entry-level NAS that is present today. This is the Asustor AS1002T. It’s a really good device when it comes to performance and its price range. Just like all other storage manufacturers, Asustor discontinued and then updated their line of NAS devices. With that, their newest update to entry-level NAS is the AS1002T V2. Just by looking at its name, you already know that it’s the upgraded version of the AS1002T. The AS1002T V2 has a much faster dual-core ARMADA 385 processor that has been clocked at 1.6 GHz. This is compared to its previous generation which is clocked at just 1.0 GHz. The AS1002T V2 still offers you the same great features of the Asustor Data Master OS; plus, it also continues to provide NAS services that are budget friendly. So now that we’ve also gotten our hands on the AS1002T V2, let’s see how it compares with the previous version and if it’s just as good as what they claim it to be. First up, let’s check out what’s in the box. Asustor AS1002T V2 Review – What’s in the Box? When we received the AS1002T V2, we noticed that its packaging was just as similar to that of the AS1002T. The only difference between the two is the name written in the box itself. The company always ensures to display every important and necessary information that you’d need, and it’s actually one of the things we really like about Asustor. With a quick glance, any customer who is out shopping and scouting for a NAS device will instantly get detailed information about their products. It will save them from wondering if the device’s features are based on their preferences and needs. Consider it as a five-second introduction of the unit that’s presented in the package. Another thing we liked about Asustor’s packaging was the presence of a plastic handle. You’ll get to easily carry the device around without any worries. To easily get acquainted with the ADM and NAS, the company included a couple of QR codes in the box to help you in getting started. All of the NAS devices from Asustor come in thick and durable plastic foam to better protect the device from any damages it may incur during transit. It’s also worth mentioning that all of their products are wrapped in a plastic bag to avoid getting the devices scratched in any way. Aside from the NAS device itself, the package of the AS1002T V2 also includes a quick startup guide, Power Brick, a manual for the installation CD, a bag containing mounting screws for the hard drive, and an Ethernet cable to link your NAS device to the network. Now, we’re going to talk about the AS1002T V2 itself and we’ve separated this portion into two categories. Let’s begin with the device’s exterior. The AS1002T V2’s outer shell is made entirely from ABS plastic. The only component that is made from metal is the base which mounts the daughter and motherboards. The front portion of the device does not feature any buttons, and the only one that you’d find on the unit is located at the back. This button functions as the Power On / Off switch for the whole AS1002T V2. Continuing with the front portion, there are a couple of LED lights that display the Power State, Network, Hard Drive activity, and Disk Activities. When you check out the back of this device, you’ll find a Reset pinhole which is, obviously, for resetting the NAS to its factory settings. Now for cooling, the whole system is cooled actively by a 70-millimeter PWM fan. When you look at the sides of the device, you’ll notice that there are no air vents around. This also goes for the top of the NAS as well. The only ventilation that we found was under the device. So to keep the AS1002T V2 stable, it comes with four rubber feet that also work as support. Additionally, the AS1002T V2 cannot be utilized with an SSD or a 2.5-inch drive which is just like the previous model. Now for the motherboard, it has a slight difference from the previous model. The AS1002T V2 makes use of the blue PCB motherboard, and they still continue to utilize the green PCB board. The CPU is indifferently cooled by a little aluminum heatsink. Its Ethernet controller is the 88E1512-NNP2 from Marvell, and it supports Ethernet speed rates of 10 / 100 / 1000 Mbps. Its integrated RAM comes from Samsung and is a 512MB, DDR3 chip that provides a speed rate of up to 1,600 Mbps. The CPU is from Marvell and is the ARMADA-v7 processor rev-1 dual-core. This specific model operates at a maximum frequency of 1.6 GHz and is slightly faster compared to the previous model which had the ARMADA-385 instead. The CPU for this AS1002T V2 is the Marvell ARMADA-385 1.6GHz dual-core processor and is built-in with an encryption engine. It makes use of a 512MB DDR3 memory, as well as a 2 x SATA-3 6GB / s 3.5-inch HDD. Its total internal raw capacity is 24 Terabytes while the maximum raw capacity with expansion units is 120 Terabytes. It has a total of 10 maximum drive bays including an expansion unit, and a USB 3.0 x 2 for expansion. The AS1002T V2’s maximum single volume is 16 Terabytes. There is a Gigabit Ethernet for the network, a 70-millimeter system fan, and functions with a 65-Watt power supply unit or adapter. The AS1002T V2 makes use of a 100 to 240 Volt AC; plus, features the FCC, C-TICK, VCCI, BSMI, and CE for its certifications. During operations, the NAS device consumes 14.4 Watts of power while it only consumes 6.9 Watts when in disk hibernation mode. Noise levels are at 18.6 dB, humidity is from 5 to 95% RH, while its operating temperature ranges from 0°C to 40°C. For its dimensions, the AS1002T V2 is 165 x 102 x 218 millimeters (H x W x D), and weighs a total of 2.18 pounds. All of the NAS products from Asustor are given a three-year warranty. The company continues to offer excellent customer service since it is a priority in providing the top standard for technical support and after-sales services. The AS1002T V2 has been upgraded and improved with the latest dual-core 1.6 GHz CPU. With software and hardware optimization, this new NAS device from Asustor can offer over 110 MB/s of read and 98 MB/s write speeds. This is around 20% faster and more efficient compared to that of the previous generation. Simultaneously, the overall system performance, app execution & installation, ADM OS, file downloading & uploading, as well as the photo album browsing has been greatly improved, making the device work faster and more efficiently. The AS1002T V2 greatly redefines and improves NAS aesthetics. Its stylish cover with a diamond-plated finish makes for an elegant and classy addition to any area, no matter if it’s your living room or your office. The NAS series features an improved slot for the internal hard drive and is designed to make it fully compatible with the 3 ½-inch hard drives that are available today. It also backs hard drives that feature large capacities while also improving on the flexibility for building private clouds. The AS1002T V2 surprisingly produces just 19 dB of noise when on standby, which is equivalent to the sound of a pin dropping to the ground. During operations, it only reaches 32 dB of noise which is just like hushed tones and whispers in a quiet library. With this feature, you can literally integrate this NAS system into any living environment. The AS10 series of devices features a slide-out cover design which conveniently allows you to remove this whenever necessary. Its inner hard disk rails, as well as the outer cover utilizes hand screws which allow for an easier process for installing the hard disks without additional tools. This NAS product is developed and designed based on ecologically friendly ideas. When utilized, it consumes less power compared to your average server or computer. When in disk hibernation mode, the AS1002T V2 only consumers a low Wattage of power, and that also goes for its power consumption during normal operations. The device offers smooth and quick multi-user and cross-platform access that allows you to readily link your NAS device from Mac OS X, Windows, or the Unix-like OS’, no matter if you’re utilizing a notebook, smartphone, or a PC. This device from Asustor lets you install up to a total of two hard disks while providing RAID1 data protection. This lets you simultaneously backup and store data with ease. Furthermore, the ADM security configuration gives you better and more improved protection for data while the secured network connections provide stress-free access for your convenience. The devices from the AS10 series offers a wide range of backup options. These are also connected to different public cloud storage services such as Dropbox, Amazon S3, OneDrive, Google Drive, Box.net, Ralus, HiDrive, xCloud, WonderBox, and CrashPlan to ensure proper backup data, you can also use USB external hard drive enclosures, FTP explorer, external hard drives, as well as local backup. Whether you use Windows, Linux, or Mac, Asustor has all the best backup tools. The exclusive Cloud Connect technology of Asustor allows you to access and share your files wherever you are since it can connect your NAS device to your mobile phone. Asustor’s mobile apps feature pass code lock functions to keep your data and privacy secure. HTTPS connections can also be used for additional protection. Asustor’s products under the AS10 series feature an integrated CPU floating point unit which can immediately process a lot of photo thumbnails. This enables you to quickly browse through and transfer images anytime. A wide variety of multimedia server apps are present so you can smoothly stream high-definition multimedia entertainment to your computer, tablet, UPnP / DLNA player, Web browser, and even your smartphone. The Asustor Data Master or ADM is the company’s dedicated operating system for all of their NAS devices. The software provides you with a familiar and intuitive user experience that is similar to a number of tablet device interfaces, effectively giving a zero-learning curve. With the ADM software, you’ll get to customize and design the sign in page, as well as select the images you want to give your device a uniquely aesthetic appearance. Not only that, there’s also an extra variety of available customizable selections to help create your truly personalized NAS, which is really cool and convenient. The ADM provides you with a smooth process of cross-platform file sharing which lets you easily access your NAS device from Mac OS X, Windows, or even the Unix-like OS’. Furthermore, all of your data will be easy to access, whether you’re utilizing a notebook, a PC, smartphone, or a tablet. The ASUSTOR AS1002T V2 NAS provides a full host of data backup and protection solutions for your convenience. The App Central feature is ADM’s exclusive application repository that contains a number of great offerings and surprises for you and every other user. With this, you can install different types of unique applications for free; you’ll only need to give a few clicks and you’re all good to go. If you get annoyed with routing settings, you won’t have to worry about this further. You just need to open a web browser, use the Asustor Cloud ID + EZ-Connect to link easily to your NAS device. This will let you access important files anytime and anywhere; so no matter where you are, as long as you have internet connection, you’ll be able to log in your NAS device via web browser. Through the ADM & Asustor EZ Synch’s integrated EZ Sync Manager, all files from your computer can be easily synchronized to the AS1002T V2 no matter where and when it is. With the AES and EZ Sync Manager, your AS1002T V2 NAS will act as your personal Dropbox with an abundant capacity right at your fingertips; this is with the time version. If you accidentally overwrite a file with the wrong details, don’t worry since you can restore this via the previously saved copy. Very convenient if you tend to overwrite data while at work. With the addition of the ADM 3.2.2, the IHM tools from Seagate are included in each Asustor device, provided an Ironwolf Pro or Ironwolf drive that is equipped to utilize each of these features. With the IHM tools, understanding the health of your hard drive will be less complex and more convenient than ever. It will also boost the chances of finding any malfunctions to your hard drive, as soon as possible. The ADM 3.0 Surveillance System allows you to have easier and more seamless connections by backing the new Internet Passthrough Function. This aids you in simplifying any complex router configurations; so even if your mobile device is under multiple router environments or is under the local network, you’ll only need to upgrade your app to the newest version that supports ADM 3.0. Once done, you’ll be able to readily link your AS1002T V2 to instantly access the Surveillance Center anytime, anywhere. If you’re a computer user, you’ll only need to install the latest Asustor Easy Connect or AEC utility to get to use the internet. This can easily achieve almost two times more of the compression rate as the H.264 which lessens stream size without having to sacrifice the quality or resolution. Support for the H.265 also decreases bandwidth consumption while simultaneously providing smoother and quicker streaming during live video viewing, as well as playback scenarios. The Surveillance Center 2.8 backs H.265 on iOS devices, Windows, as well as local display live view. Asustor also claims that there will be other platforms supported in the very near future which is something that we’re really looking forward to. Additionally, it can also resolve high-resolution videos using the H.265 that will output to a suitable image resolution to your mobile device. The NAS’ built-in speakers and microphones allow cameras to offer two-way audio. Aside from monitoring the audio of a specific spot, you can also make announcements and have a conversation in real-time with anyone in a monitored area. Even mobile users can watch a live viewing of their remote camera while having two-way audio conversation via Ai-Secure. If you use your mobile device, you can enable or disable the directly remote IP cameras via AiSecure. With that, you can decide whether you want to switch your camera on or off to protect personal privacy and save video storage space. You don’t need to sit in front of your computer to manage your cameras by Surveillance Center anymore, which makes things a whole lot easier. Surveillance Center 2.8 includes more various compatible camera models from world renowned brands including Dahua, Beseye, EDIMAX, Foscam, Eminent, GeoVision, VIVOTEK, and Hikvision. The Asustor AS1002T V2 is a highly impressive upgrade from its predecessor which is the AS1002T. From its exterior, there are virtually no visible differences between the two, yet when it comes to the internal components, this is where the differences will be seen. The brand new CPU chip has been clocked higher on the AS1002T V2 than the previous model, though what surprised us was that even when the CPU was going through extreme loads, its passive cooling continued to keep the device cool. Not only that, but the NAS device was also extremely quiet under heavy loads. So if you’re in search of a quiet NAS device that works well under big loads, the AS1002T V2 is your best bet. As for networking performance, the AS1002T V2 has everything that a Gigabit networking offers. For an entry-level two-bay NAS device, we think that its transfer speed is outstanding and is very much similar to that of the limits in Gigabit. All in all, we’re giving two thumbs-up for AS1002T V2’s performance. After having the AS1002T V2 for over a week, we can surely say that it’s a great NAS device that has been enhanced exceptionally. The Asustor Data Master was able to offer a great selection of applications, and we were able to install and run without getting charged in any way. It’s pretty cool since it was something that we’d been expecting from the beginning. Its entire build is perfectly sleek and attractive, plus it’s also tough and durable which is something we really appreciated. As for the accessories included in the package, it’s also nice that Asustor included everything that we’d need for installing. As for its performance, we can’t deny that all the upgrades and improvements that the company made were perfect. No problems or issues occured when we used it, and it was also silent the whole time we tested this. 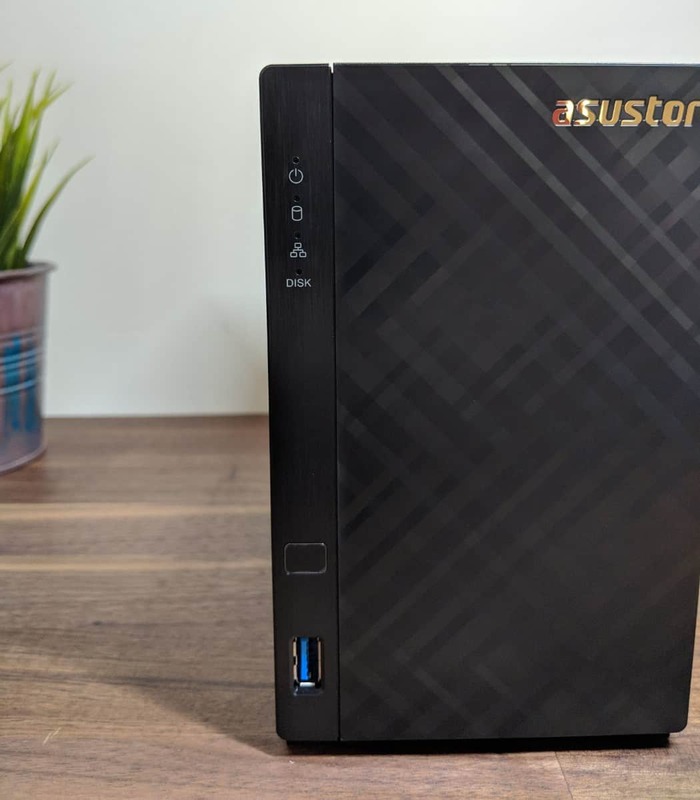 Overall, if you’re someone searching for a file storage that provides you with excellence, efficiency, and entertainment as well, then we highly recommend the AS1002T V2 from Asustor. You can pickup the Asustor AS1002T v2 for around $260AUD from your local retailer. For more information head on over to the official product page. Probox2 Remote+ Facebook Giveaway. There are 3 up for Grabs!